If your current kitchen is starting to age or it’s just not working for you anymore, it might be time for a custom kitchen remodel from Kenwood Kitchens. Your kitchen is the most-used room in your home. Between preparing and eating meals, keeping it clean, and countless other tasks you and your family spend a lot of time in there! 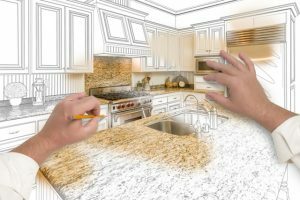 If your current kitchen is starting to age or it’s just not working for you anymore, it might be time for a custom kitchen remodel from Kenwood Kitchens. A pot filler- we can add a tap above the stove so that you can fill pots with ease. No more hefting water across the kitchen while you try to keep it from splashing out! An extra dishwasher- when you remodel your kitchen, you can add a second dishwasher so you won’t have to worry about dirty dishes piling up again. Add an island- so many new kitchens have an island. A kitchen island is a fantastic multi-purpose space: use yours for preparing meals, eating, homework, and so much more! Your kitchen flooring is a very important part of your kitchen. Is your current floor starting to show its age? Do you want something more durable and resilient? Or, are you just sick of seeing the same old thing every day. Regardless of your reasoning, new flooring is a part of your kitchen remodel. You will be able to choose a new floor that will blend seamlessly with the rest of your design. Advancements in flooring are happening every day, so we are able to bring you quality options that may not have even been available when your current floor was put in. No two households are alike. A “cookie cutter” cabinet design just isn’t going to work anymore. More and more homeowners are discovering the many benefits of custom-designed cabinetry. During the kitchen remodel process, our professional design team will work closely with you to come up with the perfect storage solutions that will work for you and your family. Ready to get started on your next kitchen, bathroom or closet project? Kenwood Kitchens can help. Since opening its doors in 1974, Kenwood Kitchens has made a name for itself throughout Maryland as a complete kitchen and bathroom remodeling firm. We want our clients to get what they deserve: a quality installation with quality products, at a fair price. Contact our expert planners today for a free consultation about your dream project. Our showrooms are unparalleled, each has seven full models for you to explore. With showrooms located in Lutherville, Abingdon, Columbia or Annapolis, Maryland, Kenwood Kitchens is the place for all of your kitchen and bathroom needs. Don’t hesitate to give us a call at (800) 211-8394. This entry was posted on Friday, March 16th, 2018 at 10:24 am. Both comments and pings are currently closed.